After 21 years the Chicago Bears are back in the Super Bowl! The team that brought us “the Fridge”, “Sweetness” and the “Super Bowl Shuffle” will be meeting Tony Dungy, Payton Manning and the Indianapolis Colts on Sunday, the 4th of February, for Super Bowl XLI at Dolphin Stadium in Miami, Florida. This will be the first Super Bowl with a team coached by an African-American head coach. On Sunday, January 21st, Lovie Smith of the Chicago Bears became the first black head coach to play in the Super Bowl. Just a few hours later Tony Dungy of the Indianapolis Colts, Lovie Smith's mentor and friend, became the second. For Midwesterners Super Bowl XLI will be a great contest since the competing teams are both from the Midwest, specifically Chicago and Indianapolis. I, for one, cannot wait to witness the severe beating the Bears are going to inflict upon Tony Dungy’s Colts. The Super Bowl is one of the most popular and anticipated events of the year. According to the Neilsen ratings some 90 million Americans will watch the Super Bowl. The Super Bowl is a great American contest. The Chicago Bears quarterback is Rex Grossman. The Indianapolis Colts quarterback is the great Peyton Manning. Joseph Addai, Marvin Harrison and Adam Vinatieri are just a few of the Colts great players. The Chicago Bears have a much longer list of outstanding athletes. 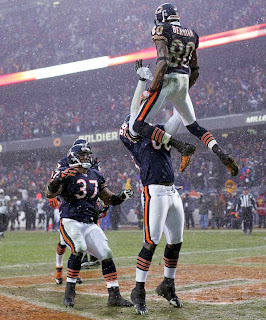 Brian Urlacher, Cedric Benson, Desmond Clark, Lance Briggs, Brenden Ayanbadejo, Muhsin Muhammad, Thomas Jones, “Tank” Johnson, Rashied Davis, Bernard Berrian, Tommie Harris, Charles Tillman and the great record-setting rookies Devin Hester and Robbie Gould. These are the 15 or 16 players that will be remembered for making the great plays and winning the Super Bowl. However, the Chicago Bears employ 61 athletes to play football. Should the Bears do what they’re expected to do they will win the Super Bowl. When they do, everyone will get a ring. Therein lies the beauty of being a part of the winning team. When the Chicago Bears defeated the New Orleans Saints to win the NFC Championship Rex Grossman declared himself to be “one game away from wearing a ring the rest of my life.” However, It won’t be Rex Grossman’s victory alone. Chicago Bears second string quarterback Brian Griese, who has not started a single game this season and only took 6 snaps in actual play, will also wear a ring. So will third string quarterback Kyle Orton. The entire team will wear a Super Bowl ring for the rest of their lives, not just the players in the headlines. It’s the greatest thing about being on the winning team. 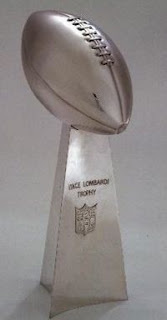 All 61 players, whether they break a sweat or not, will go home with a ring because their team won Super Bowl XLI. It’s not just the playmakers and the sensational athletes but every second and third string player on the team will have a ring and a memory the rest of their lives. That’s also the beauty of being apart of the winning side in eternity. Everyone wins a crown. Not just the preachers, singers and evangelists. Not just the ones we revere and respect but every Christian who was a part of the “team” will win the victors crown! It is the most feared creature in the Amazon. More feared than the vicious Piranha or the cruel Anaconda. 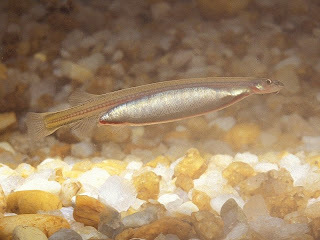 It is a tiny catfish called the Candiru. The Candiru is a freshwater fish in the catfish family found in the Amazon River. The species has been known to grow to a size as large as 6 inches in length. The Candiru is eel shaped and translucent, making it almost impossible to see in the water. The candiru is a parasite. It senses a host nearby by detecting urea and ammonia expelled from the gills. It swims into the gill cavities of another fish, erects a spiney barb to hold itself in place, and feeds on the blood in the gills, earning it a nickname of the "vampire fish of Brazil". This vicious little fish will attach to a host fish, fill itself with a blood meal and then dislodge to return to its darkness, leaving a fatal wound on its victim. This mean little fish has even been known to attack humans in a manner too horrifying to discuss. What this fish does to its host is reminiscent of the effect bitterness has upon a soul. I know a family that is absolutely eaten up with bitterness. It attached itself to them, fed itself on that which was alive in them, and then left them with a wound that would never heal and eventually be fatal to their soul. The amazing thing is that their bitterness stemmed from a supposed desire to forward the work of the Kingdom of God. It’s no wonder the vicious Candiru is feared even above the Anaconda or the Piranha. You can see and defend against the attacks of this diabolical duo of the Amazon. 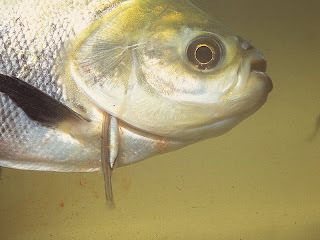 The Candiru is more dangerous because it is not easily seen. It is translucent, meaning light radiates through its flesh rather than bouncing off it. Bitterness has the same effect. It is difficult to guard against because it usually covers itself in supposed light. How many a person has become bitter over what they fully esteemed to be a righteous cause. Furthermore, the Candiru does no immediate harm to its host. It simply draws its blood meal until it is satisfied and then when it finishes it is the dislodging that creates the non-healing and quite fatal wound. Bitterness has its effect only after the fireworks are over and the damage has been done. It leaves a weakened soul to slowly die of a wound that it will not allow to heal. So then how do you avoid the Candiru? How can we stay away from this most bitter of fish? We must remember that the Candiru is a catfish. It lives in the cold, dark shallows of the river. To avoid the Candiru one must stay out of the shallows and avoid the darkness. To avoid bitterness, one must stay out of the shallows and avoid the darkness. Joe Bieger walked out his front door with his two dogs one morning last fall a beloved husband, father, grandfather and assistant high-school athletic director. Minutes later, all of that — indeed, his very identity — would seemingly be wiped from his brain’s hard drive. For 25 days, he wandered the streets of Dallas and its environs a lost soul, unable to remember his name, what he did for a living or where he lived, until, finally, a contractor who was building a new house for Bieger and his wife happened to recognize him. By that point, Bieger had somehow made his way to a suburb about 20 miles from his Dallas home, holes worn in the rubber soles of his canvas shoes. He had lost 25 pounds, and a full white beard covered the normally clean-shaven educator’s face. Bieger, 59, says he was diagnosed afterward as suffering from psychogenic fugue, an extremely rare form of amnesia. Now reunited with his family and back at work, Bieger agreed to tell his story to The Associated Press. Bieger says he has regained all his memories up to the point he wandered away, and is amazed at the outpouring of support he received from friends, co-workers and the hundreds of volunteers who helped search for him on the streets, at hospitals and in homeless shelters and soup kitchens. Bieger is under the care of a doctor who specializes in such cases. And his cell phone now includes a GPS tracking device. But more than three months after the episode, he says he has only vague memories of those days on the streets of Dallas, one of America’s most crime-ridden cities. He recalls being stopped and frisked by police officers, who were looking for a suspect in a holdup at a pizzeria. There was also a smoky bowling alley. 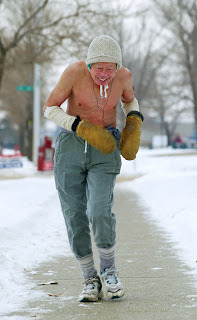 He remembers waking up cold on a playground, wearing shorts and a T-shirt with fall temperatures dropping into the 50s. Another time, he says, he awoke under a construction trailer. He says he cannot recall what he ate to survive. But when he was found, he had jelly packets from a fast-food restaurant in his pockets and half a stale bagel. The complete AP story is dated January 26th, 2007 from DALLAS. What incredible value there is in having a name. On the surface we ought to be grateful we know our name! Here is a man who wandered the streets of the Dallas metroplex with absolutely no recognition of his name, the location of his home, his family or how to find them. What a blessing it is to come home to a family at the end of the day. There are stresses and bills and disagreements but at least I know where they are and I know they’re mine. The bills mean I have a home. The pain means my body is healing. The arguments mean I have friends. The disagreements mean I have family. The fatigue means I have a job. However, beyond the surface interest in this story there is spiritual insight. When James and John suggested that fire be called down from heaven, and a city destroyed, Jesus rebuked them saying, “ye know not what spirit ye are of” (http://bible.cc/luke/9-55.htm ). They had a spiritual amnesia. Not knowing who they were or what they were called to do. 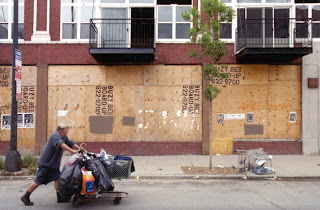 I wonder how many people are wandering the streets, sitting on church pews and occupying homes today, stricken with a spiritual amnesia; An identity crisis with eternal consequences. We get up and go about our business with no thought for who or what we really are at our core. We have no room, it seems, in our culture for self-evaluation and discovery. 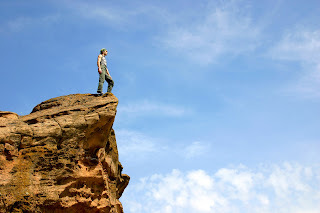 We assume everything’s okay because we eat, sleep and pay the bills but I would contend that there is more to life than mere existence or survival. There is a spiritual and purposeful level that each soul can reach in our brief time on earth that can benefit the now as well as prepare for the hereafter. 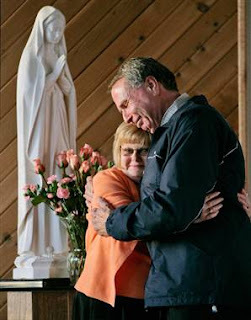 It is heartwarming that Joe Bieger has been reunited with his memories as well as his family and it gives us a picture of what can happen to all of us spiritually. We don’t have to wander without a name. 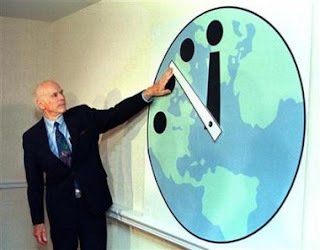 The Doomsday Clock is a symbolic clockface maintained since 1947 by the Board of Directors of a magazine for physicists, the Bulletin of the Atomic Scientists at the University of Chicago. It uses the analogy of the human race being at a time that is "minutes to midnight" where midnight represents destruction by nuclear war. Since its introduction, the clock has appeared on the cover of each issue of the Bulletin of the Atomic Scientists. The number of minutes before midnight, a measure of the degree of nuclear threat, is updated periodically. The clock is currently set to five minutes to midnight (the 1st time ever set to 5 minutes), having been advanced by two minutes on January 17, 2007. The furthest the clock has been is 11:43, 17 minutes to midnight, in 1991 when the USA and Russian signed a nuclear arms reduction treaty. The closest the clock has been set to midnight was in 1953. The USA and USSR both tested nuclear arms within weeks of each other. The clock was set to 11:58, two minutes to midnight. 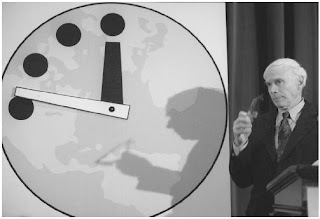 The clock was started at seven minutes to midnight during the Cold War in 1947, and has subsequently been advanced or rewound at intervals, depending on the state of the world and the prospects for nuclear war. Its setting is relatively arbitrary, set by the Board of Directors at the Bulletin of the Atomic Scientists in response to global affairs. The setting of the clock has not always been fast enough to cope with the speed of global events, either; one of the closest periods to nuclear war, the Cuban Missile Crisis in 1962, reached its head and resolution in a number of weeks, and the clock either could not be changed or was not changed to reflect any of this at the time. Nevertheless, the changing of the clock usually does provoke attention. The clock's hands have been moved 18 times in response to international events since its initial start at seven minutes to midnight in 1947. Neil Steinberg at the Chicago Sun-Times declares the Doomsday clock to be one of the most successful PR endeavors a magazine has ever developed. By simply illustrating how near they believe the world is to global nuclear destruction a relatively obscure magazine has gained enormous political significance and newsworthy importance (http://www.suntimes.com/news/steinberg/217470,CST-NWS-stein19.article ). That there is awe and respect given to the University of Chicago’s Doomesday Clock is not surprising. Alarmist tactics have always been able to generate respect and serious consideration as long as they have not come from Christians. When a physicist, a scientist or Al Gore say that the world is in trouble and a state of decay people declare them to be insightfull, discerning and courageous. When a Christian believes that sin has damaged God’s creation and the only hope of rescue is Jesus Christ we’re denegrated as unreasonable, nonsensical wackos. When a scientist says it's five minutes to midnight it makes headline news. When a preacher says that Jesus is coming back soon it makes people mad. Jesus had the same complaint concerning the people of his day. They would look to the weather, the sun, the stars and moon and draw conclusions based upon what they saw. “And he said also to the people, When ye see a cloud rise out of the west, straightway ye say, There cometh a shower; and so it is. And when ye see the south wind blow, ye say, There will be heat; and it cometh to pass. Ye hypocrites, ye can discern the face of the sky and of the earth; but how is it that ye do not discern this time? Yea, and why even of yourselves judge ye not what is right?” ( Luke 12:54-57 ). He declared them to be hypocrites because they could discern the face of the sky but they could not discern the signs of the times ( http://bible.cc/matthew/16-3.htm ). Is there really a clock that is measuring the time remaining for the earth? Yes. Is it located in the physics department of the University of Chicago? No. It is located in the mind of God and is entirely under the direction of the hand of God. God’s timetable is the only timetable I want to be concerned with. This past week (1/8/07 – 1/12/07), "Good Morning America" did a series concerning how Americans live when the things many people rely on such as makeup, cell phones, debit cards and coffee are taken away for one week. They found people who relied on the item in question and then followed them for one week as they tried to live without it. They conducted an online poll asking the question: Which of the following could you not live without, even for a week? Of 6,249 responses 2,171 said coffee, 1,876 said debit/credit cards, 1,199 said their cell phone and 1,003 said makeup. I know two individuals in particular who could not function without a pot of coffee in each of them! I know a gentleman, as well, who could not make it through the day with at least one cell phone on his waist at all times. Why do I say "at least one"? Because He owns 4 cell phones and has three phone lines in his home! His wife has often said when they bury him they're going to have the casket retrofitted with a phone jack and an antenna! 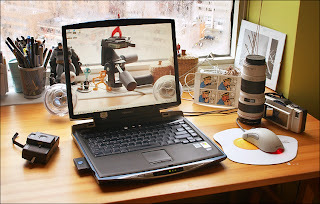 It started me thinking about the things we depend on to bring ease into our daily routine. Nearly everyone has something that they rely on every day to alleviate the stress of their daily chores. While I am probably among those who rely on their cell phone the truth of the matter is that I rely on my wife more than anything. More specifically, my wife’s purse! Everything I own lives in my wife’s purse! My wallet, the cell phone, my pen, carmex, the keys and anything else I need to have handy during the day. I know I depend on her (and her purse) because when she is not around I often find myself discombobulated. I hate carrying stuff in my pockets and I don't know what to do with stuff when my wife isn't around with her purse. I don't want my wallet in my back pocket and a pen in my shirt pocket and keys in my pants pocket. It's too much stuff on me. I just need my wife's purse! The GMA series was interesting to me because it allowed the reader a moment to pause for much needed self-evaluation. I don’t think we (“we” meaning Americans and Christians) spend enough time engaging in self-evaluation. I know I don’t. I think it is healthy to spend some time every once in a while, either with a loved one or a journal, evaluating our priorities and examining the trends we’ve been developing in our families and lives. I know one thing for certain, our family genuinely depends upon God. We have found Him to be faithfull in every situation. Every night I pray over my family and I not only believe He will keep and protect us, I know He has been the One who has brought us this far. I honestly don’t know what I would do if I didn’t have the Lord to depend on. When my daughter or my wife is sick I pray with confidence that He will heal them. When the funds are low and the debts are high I pray with assurance that God will provide for our needs and He has done just that time and time again. It is no cliché when we say we could not make it without Jesus! I was glad that I was asked to evaluate what makes me and my family “tick”. It caused me to realize and appreciate, now more than I had in the past, how much of what we have is the direct result of the hand of the Lord on and in our lives. So my advice is to slow down, step back and take it all in. Don't miss what's really going on. Get an understanding of the "big picture" in your life and family. Sometimes a step back to take in the big picture, as well as some critical evaluation, can cast new light on things we’ve been simply accepting or taking for granted. Sometimes we’ve been missing the forest for the trees. I now know what I couldn’t go a week without,…my wife’s purse! 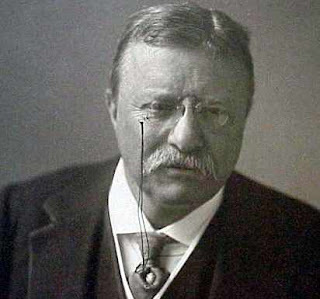 I’ve been reading a biography of President Teddy Roosevelt and I’ve found him to be a fascinating man. He did more in his lifetime than others might dream ever about. In fact, the things he did with regularity might be the one dreamed of accomplishment on other men’s list. In March 1909 Roosevelt left New York for a safari in Africa. The trip was sponsored by the Smithsonian Institution and the National Geographic Society and received worldwide media attention. His party, which included scientists from the Smithsonian, killed or trapped over 11,397 animals, from insects and moles to hippopotamuses and elephants. 512 of the animals were big game animals, of which 262 were consumed by the expedition. This included six white rhinos. All of this was done after he had served two terms as President of the United States! While campaigning in Milwaukee, Wisconsin on October 14, 1912, a saloonkeeper named John Schrank failed in an assassination attempt on Roosevelt. Schrank shot the former President, but the bullet lodged in Roosevelt's chest only after hitting both his steel eyeglass case and a copy of his speech he was carrying in his jacket. 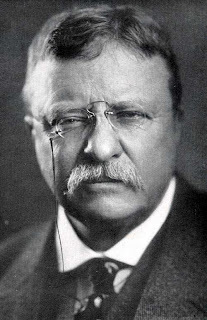 Roosevelt declined suggestions that he go to the hospital, and delivered his scheduled speech. He spoke vigorously for ninety minutes and his opening comments to the gathered crowd were, "I don't know whether you fully understand that I have just been shot; but it takes more than that to kill a Bull Moose." Afterwards, doctors determined that he was not seriously wounded and that it would be more dangerous to attempt to remove the bullet than to leave it in his chest. Roosevelt carried it with him until he died (http://en.wikipedia.org/wiki/Theodore_Roosevelt ). Roosevelt was simply hard to stop. I like that attitude. I want to adopt that attitude in my life. One of my favorite poems is entitled, “Don’t Quit”. The attitude of that poem is one that will carry an individual through the toughest of circumstances. No one denies the presence of negative influences. No one disavows that wrongs are committed. No one dismisses that actual injuries have been inflicted upon our spirits. No one will refute that some have been handed a raw deal in life. What we will do, however, is refuse to allow those things to claim authority over the course we will travel in life. We will refuse them the ability to dictate our present response and future results. We will say, “It is well” even when it is not well. Now, the truth is, things did not look well. She was in great distress and fearful, her husband didn’t care enough to help their son, even so much as questioning her intentions in running to the man of God, and her son was dead. Things did not appear to be well. In fact, I am not sure I would not have answered the old prophet differently. However, her answer is indicative of her faith and complete reliance on her God. She answered the man by saying, “It is well!” (http://bible.cc/2_kings/4-26.htm ). It is well. Three little words that make a big difference. I want that to be my new motto of faith for my life. It is well. Things will get better. God is aware of my circumstances. I will make it through. Not around, not over or under, but I will make it through! After all, it takes a lot more than a bullet to the chest to stop a bull moose and it takes a lot more than a little adversity to stop a child of God! There’s a new phrase in Australian vernacular. When someone has been steady and consistent at their particular endeavor and unexpectedly won a victory, despite odds against him, it’s now known as “Doing a Bradbury”. Stephen Bradbury competed in events in three Olympic games. He was a consistent failure; and then he won the gold. It happened during the men's short track 1000 metres event at the Salt Lake City 2002 Winter Olympic Games. In the quarterfinals, Bradbury finished third but when another racer was disqualified it allowed Bradbury to advance to the semifinals. In the semifinals Bradbury was in last place but when three of the other skaters crashed into each other he finished in second place, allowing him to advanced to the final race. In the final race Bradbury was in dead last in the final turn. Amazingly, four of Bradbury's competitors (Apolo Ohno, Ahn Hyun-Soo, Li Jiajun and Mathieu Turcotte) fell into one another in the final turn allowing a slow and steady Bradbury to skate into the history books with his first Olympic gold medal. 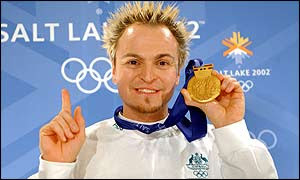 Bradbury returned to Brisbane with a gold medal, the first for Australia or any Southern Hemisphere country in an Olympic Winter Games event. There’s something to be said for staying on your skates. There is value in faithfulness. Faithfulness is a long ago forgotten word that, despite its reputation, still holds meaning today. Sadly we often simply give up when things get uncomfortable or inconvenient when we would have found incredible value had we been faithful and endured. There is accrued equity, not only in financial matters but also in life, from faithfulness to an endeavor. I want to be faithful. I want to “stick it out” even when things get tough. I refuse to give up easy. Things may not be spectacular right now in this current 5.5 yard run but it will become valuable through my faithfulness! It may not seem impressive right now but those years of faithfulness will add up into something incredible! 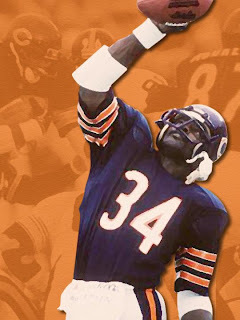 One of the most well known and well liked Chicagoans was the late great Walter Payton. Walter Payton is arguably, one of the greatest football players of all time (if you want to have that argument, by the way, just head to Ditka’s Restaurant on 100 East Chestnut Street downtown Chicago). Walter Payton was the running back for the Chicago Bears from 1975 to 1987. He held the NFL record for rushing touchdowns, with 110, and the record for career rushing yards in the NFL, with 16,726 yards. What makes these statistics amazing however, is that his average carry was 5.5 yards. He didn’t set records with impressive 25, 30 or 50 yard carries. No, with consistency and determination he rushed 16,726 yards, 5.5 yards at a time. I think that’s what God expects of His children. Not personality perfection or flawless Christianity. Not impressive achievements and grandiose religious endeavors but steady, consistent, faithful attention to “running the race” (http://bible.cc/hebrews/12-1.htm ). I want to be faithful to God because He’s been faithful to me. The old cliché says, “Slow and Steady wins the race.” Maybe that’s what the Preacher was talking about when he said that the race goes “not to the swift, nor the battle to the strong” (http://bible.cc/ecclesiastes/9-11.htm ). Jesus summed it up best by saying, “He that endureth to the end shall be saved.” (http://bible.cc/matthew/10-22.htm ). I don’t know about you but I feel like running on! I did my first wedding a few weeks ago. My cousin married a fine young man she met in St. Louis while attending Gateway College of Evangelism and they asked if I would officiate at their wedding. It was a wonderful day. I shared the task of the wedding with the grooms grandfather, also a minister. We spoke after the wedding of a unique event that occurs during a traditional ceremony. The moment the entire congregation and the wedding party awaits is the opening of the doors for the entrance of the bride. Everyone stands, turns and watches the beautiful bride make her way through the sanctuary. The ushers watch the bride. The groom’s side of the church watches the bride. The bride’s side of the church watches the bride. The wedding party watches the bride. The ministers watch the bride. The groom watches the bride. Quite simply everyone in attendance watches the bride. Except for the bride. The bride watches only one person; the groom. Especially when you consider that the scriptures liken the Church unto the bride of Christ (http://bible.cc/2_corinthians/11-2.htm ). This world is watching the bride. How important that the church care for itself and its appearance and make our “calling and election sure” to be the bride the world is waiting, yea needs, to see. 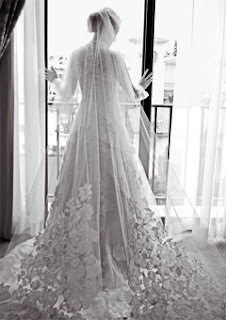 The bride, however, who has made herself ready, will be watching no one but the groom. Maybe that’s what Paul was talking about when he encouraged us to be “Looking unto Jesus the author and finisher of our faith”. Why? Because it is “unto them that look for him will he appear the second time without sin unto salvation”. It is very difficult, with all the possibilities that surround us, to keep our eyes focused only on Jesus Christ. We’ve got tv, radio, the internet, shopping centers, movies, iPod’s and more to entertain us and keep our minds on everything but Him “with whom we have to do”. I remember the day I married my beautiful wife. She was a gorgeous sight. Every eye in that church was on her. It thrilled me that when she walked through the rear of the sanctuary, as beautiful as she was, she was watching me. I wonder if that’s how the Lord feels when His people are watching and worshipping Him? I wonder if that's how He feels when we enter His sanctuary with our focus and hearts on Him and Him alone. It makes me understand and echo the words of John on the Isle of Patmos when he said, “the Spirit and the bride say, Come!” (http://bible.cc/revelation/22-17.htm ). We were on the road when it happened. I was preaching for a Pastor that has become a very good friend. He was out of town and asked that we come and take care of his services. He opened up his home to us and was very kind to let us stay in their guest room. 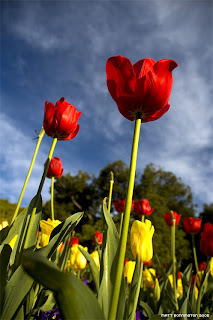 The Pastor’s wife takes great pride in her garden and the many flowers and foliage that decorate their lawn. I noticed that, since they had been out of town, no one had been watering the flowers. As I was walking outside I found the watering can sitting next to the hose and went to work. About 20 minutes into the chore I realized I was doing something I had no interest in at all. I have no green thumb. I’m not a gardener. I don’t particularly like plants enough to make the effort to grow and care for them. 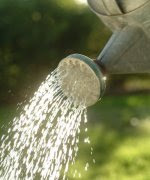 Yet here I was, trotting back and forth from the spout to the lawn, spending my time and energy watering someone else’s flora. My motivation behind caring for those plants was not my concern for the plants but my concern for the one who owned and loved the plants. I wanted her to return home and find her lovelies bright, healthy and vibrant. It was if a light went on. I don’t necessarily care for the church because I love them in particular. Sometimes my brothers and sisters are easy to love. However, sometimes it can be quite a chore to show the “brotherly love” I should. No, I don’t make caring for the church a priority because I love the church in particular. I love the church because He loves the church and purchased it to be His own. It is because I love the One who owns the church that I care and labor. I want Him to return and find His lovelies bright, healthy and vibrant. I believe this to be a stronger and more lasting motivation than loving people. If I serve only because I love people, when people become difficult to love, and challenge my affections, I might have justification to cease caring. However, if I am serving because I love Him, I will never find reason to cease caring. I’ll love what He loves and care because He cares. I’ll serve the church because I love the One who owns and cares for the church. In fact, Paul used the same argument when he instructed the ministers in Ephesus to feed and care for the flock of God because He had purchased the church “with his own blood” (http://bible.cc/acts/20-28.htm ). We care because they’re His. Bottom line. My service is to God. That is how I will endure even when people become unlovely. What an amazing revelation. His love of me is so great that it becomes the foundation of my love for others. I took apart the Christmas tree tonight. It is so much easier to take down than it is to put up. I didn’t even have to think about it. I just pulled everything off the tree and dropped it in a box. It was a different story going up. I wasn’t even allowed to touch the thing going up. My wife carefully and methodically placed every snowflake and icicle on the branch where it belonged. 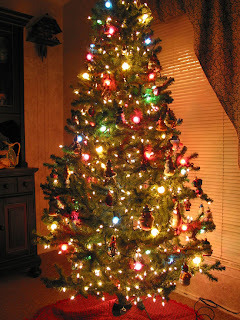 The garland was strung carefully between the lights and the ornament bulbs. Each strand of lights delicately laid to rest on a particular branch to make sure there were no “bare spots”. Yes, when the tree was put up and decorated it was a careful and deliberate process. When it was torn down it was a careless and inattentive procedure. That seems true of most things. It is easier to tear down than to build. Furthermore, it is infinitely easier to destroy what another has built than to build something of value ourselves. Most of what passes for news and entertainment in our popular culture is nothing more than mockery and criticism. The talking heads build nothing of value themselves yet they make millions of dollars criticizing those who are attempting great things and carry great responsibility. I may not agree with everything that a leader does (i.e. boss, president, pastor, etc...) but that does not license me to personally attack that person and destory their effectiveness within their area of labor. So many feel that they can freely destory anothers reputation and ability to discharge their duties because of personal or ideological differences. I simply do not believe that I have the right to destory another person; even if they deserve it. No one deserved what was coming to them more than Saul. He had David on the run and was intent on killing David if he could. Yet when David stepped into a pristine opportunity to destory Saul he would not take advantage of it (http://bible.cc/1_samuel/24-4.htm ). Twice David had the opportunity to kill Saul and twice he would not do it. Lord help me to be like David. If I have anything resembling a new year’s resolution it would be this: To be cautious in my criticism of others. It seems many, too easily I might add, are able to make hasty decisions as to an individuals motives and intents without considering the deeper causes or nuances at work in their life. We want many to leave room for error when we are being scrutinized yet we leave no room for humanness when we study the lives of others. Furthermore, the people who most gain our respect and are fondly remembered are those who were quick to offer us an encouraging word and to lift our spirits. It’s the encouragers, not the critics, who make the difference in the lives of those who make a difference. If I like to be around the people who are positive and encouraging maybe I should become an individual who is positive and encouraging. I like what our 26th president, Theodore Roosevelt, said. “It is not the critic who counts; not the man who points out how the strong man stumbles, or where the doer of deeds could have done them better. The credit belongs to the man who is actually in the arena, whose face is marred by dust and sweat and blood; who strives valiantly; who errs, who comes short again and again, because there is no effort without error and shortcoming; but who does actually strive to do the deeds; who knows great enthusiasms, the great devotions; who spends himself in a worthy cause; who at the best knows in the end the triumph of high achievement, and who at the worst, if he fails, at least fails while daring greatly, so that his place shall never be with those cold and timid souls who neither know victory nor defeat.” (http://www.theodore-roosevelt.com/trmaninthearena.html ). Mortimer B. Zuckerman, Editor of the US News & World Report (www.usnews.com) wrote in his Sunday, December 10, 2006 article about the new threat in the war on terror. It caught my attention because he sheds light on the fact that America is vulnerable, not only from enemies without our borders, but from enemies within. The threat, indeed, is from within. Homegrown terrorists who are inspired to destroy the cradle that granted them the freedom to do so. “Interviews with the heads of counterterrorism and local police officials in the United States yield similar assessments. The threat is from second- and third-generation children of immigrants, fluent in English and accustomed to American society but using the legal rights of U.S. citizenship to rebel from within. They have learned the Koran on the Internet; they lead small clusters of 20 to 25 mostly young men who share feelings of alienation, a longing for self-importance, a need to be a part of some larger group or cause. They have developed what is called "adversarial assimilation." His article strikes at so many chords it is difficult to focus on just one. I find it interesting that it is 20-25 year old young men who are “longing for self-importance” and needing “to be a part of some larger group or cause”. To me that is indicative of the importance the effectiveness of the church has on our world at large. Are we as ministers doing our best to connect with young people in our culture in a contemporary way to give them a sense of belonging and importance in a larger cause; namely the church of the living God. Zuckerman goes on to say that, “If we are to avert mass casualties from the enemies within, it is imperative to fashion a new approach to find these people. Our criminal justice model has been to look for the criminal after the crime. This won't do any longer. How do you punish a suicide bomber? We must disrupt plots before they are carried out. Gathering this intelligence will impinge on traditional civil liberties, but we simply don't have much choice. As the well-known journalist, Harold Evans, told the Hudson Institute recently, "I'd rather be photographed by a hidden surveillance camera than travel on a train with men carrying bombs in their backpack. I'd regard being blown to bits on the street as more of an intrusion of privacy than having an identity card." I find all this interesting not only on a secular level but on a spiritual level. Andy Stanley has a book entitled, “It came from within”. The Bible declares the heart of man to be deceitful, desperately wicked, who can know it? (http://bible.cc/jeremiah/17-9.htm ) Any honest man must acknowledge that we don’t fully know what lives in our hearts. We don’t know exactly what we would do in a given situation. We’d like to think we have some principles to guide us but it is amazing how being present in the moment affects rational and intentional thought. 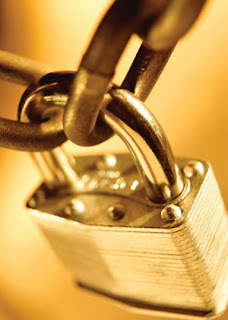 The bottom line is I must protect myself from what may or may not be growing “within”. Preventative measures are prudent for the sincere Christian. When I consider my ways I must acknowledge that it is true. The majority of the terror that sin has caused my soul has been the result of a lack of prevention. The measures necessary to defend my soul against the sin nature lurking within were accessible, known, but not acted on. Prevention is the word. Instead of focusing on catching and cleaning up after the crime, we must be focused, in Mr. Zuckerman’s advice, on preventing the crime from ever occurring. Good advice for my soul as well. I am responsible for guarding myself from what is within. Indeed, an ounce of prevention is worth a pound of cure. Furthermore, this preventative approach, both secularly and spiritually, requires the relegation of personal freedoms. How did Paul say it? “All things are lawful but not all things expedient” (http://bible.cc/1_corinthians/10-23.htm ). This war on sin might mean giving up some things I’d rather not give up but if it will protect me and my family from what might be growing within then so be it. I heard recently of a respected Pastor that confessed to his congregation that he had been involved in an ongoing extra-marital affair. People hear of his story and they say, “That’s terrible. How could this happen?” The threat from within was not prevented from carrying out an act of terrorism on the soul. We are the only ones capable, and responsible, to defend our soul from the threat within. This is a war we cannot lose.